I am still craving this! Unbelievably scrumptious and perfect for afternoon drinks over a game of croquet. Serves 4. That's if you share, I guess. Mix avocados, sour cream and lemon/lime juice. Place lettuce onto a large platter, leaving room around edges for some corn chips. Spoon refried beans on top of lettuce, then add chili sauce, avocado mix, cheese and spring onion. Refrigerate for two hours or up to 24 hours. 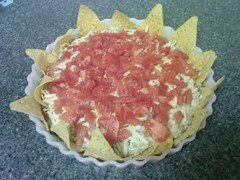 Before serving, add tomatoes and arrange corn chips around the platter's edges.